Eight years apart in age, John F. and Robert F. Kennedy were wildly different in temperament and sensibility. Jack was the leadercharismatic, ironic, capable of extraordinary growth and reach, yet also reckless. Bobby was the fearless, hardworking Boy Scoutunafraid of dirty work and ruthless about protecting his brother and destroying their enemies. Jack, it was said, was the first Irish Brahman, Bobby the last Irish Puritan. Proves that the lives and deaths of John F. and Robert F. Kennedy remain as compelling now as they were throughout the turbulent 1960s. 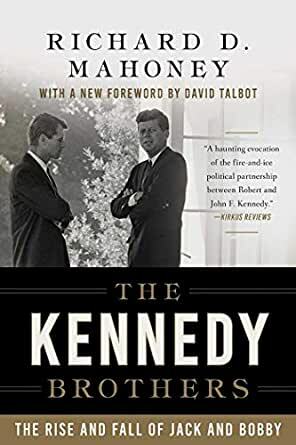 A haunting evocation of the fire-and-ice political partnership between Robert and John F. Kennedy and of how, despite energy and idealism, the brothers encountered tragedy by blundering into trackless wood of ambition and emotion. Over the past several years, I've read many books about John and Bobby Kennedy, but this one by Richard Mahoney best captures the relationship between the two men as well as their struggle against the dark forces of the Mafia, the CIA, J. Edgar Hoover, and Jimmy Hoffa. Mahoney brings to light not only the depth of the relationship between the brothers, but the significance of their bond with Jackie, Ethel and Joe, Sr. I was particularly impressed with Bobby's bond with Cesar Chavez. I had no idea if the closeness of their friendship and the impact it had on Bobby's 1968 Presidential campaign. While Mahoney writes of the efforts of prosecutor Jim Garrison to show that JFK's was likely a conspiracy of a complex nature, the author is careful to avoid making Garrison a hero. Rather, Mahoney masterfully raises the likelihood that the assassination was a conspiracy on the part of several high-ranking individuals who were intent on stopping Bobby's crusade against organized crime, lending credibility to the notion that their intent to stop RFK revolved around the need to kill JFK as a means of intimidation. This was a truly remarkable piece of literature about perhaps the two most significant brothers to serve in government in the 20th century. As a naïve young woman, I was enthralled with the Kennedys. After watching the Kennedy/Nixon debate, I, like many others, voted for Kennedy. I read all the stories about the family, watched Jackie as she showed off her renovations to the white house, agonized with her over the loss of her baby (being pregnant at the same time.) I was bathing my five-month old on the day JFK was shot, and with the rest of the nation, spent the next few days glued to our television set. Then, a few days after Christmas, when I lost my brother, I identified even more. It's disconcerting now to learn of the corruption, the power-struggles, the flaws in those people I so admired. Yet, even though I'm even more appalled after reading this book, I still have a certain degree of respect for two men who tried to do the right thing, who were effective in so many ways, and wish we had more men like them in political power, despite the flaws. And the book makes me wonder -- is all of politics like this? Is this the government of, by and for the people? 5.0 out of 5 starsWhat might America have become had the Kennedys survived? This may be the ultimate account of the Kennedys, written by someone from within Camelot but also informed by the rich history of inquiries, media commentary and personal recollection that has accumulated since that heady 60s era. It focuses not on the legend of Jack, but on the brother whose obsessive drives helped make Jack's place in history, Bobby. This brother provided the organisation that helped create Jack's sanguine, brilliant, compelling image as the great US president of our time. One of the book's poignant features as we watch the death of newspapers in this new internet age is the crucial part played by the great media writers of those times. It seems during every crisis there were reporters everywhere, in the Kennedy caravans, in their homes, even, recording, pontificating, advising. Their power was immense. The writer makes frequent use of their words. A description of Bobby Kennedy on the campaign trail by a New Yorker writer is almost absurdly detailed in its intrusion. Many of them, it seems, perhaps with the benefit of hindsight, foretold the inevitable outcome of the Kennedy obsession with disrupting the entrenched power structures, especially those linked to organised crime (including the people who were meant to be bringing it to heel, the FBI and the CIA). This is a bleak narrative. Its central theme is the trouble America found itself in as post-WW II prosperity was revealed to have trampled on and dispossessed vast numbers of people, the Blacks, Hispanics, Indians, and others. Bobby Kennedy's headlong tilt at the perceived causes of inequality proved quixotic, of course: America is to this day riven with racial unrest whose ghastly shapes appear unchanged despite the passage of half a century. How might it have been had he and his brother survived? We'll never know. This work goes into great depth into the characters of the Kennedy brothers. JFK and RFK were men of drive and also men with flaws. At the time of John Kennedy's presidency the media created a myth of Camelot, but the reality of the times was far from it. The nation and the world were perhaps fortunate to have such men in position of power when the Cuban missal crisis occurred. However the Bay pf Pigs disaster and other plans dealing with Castro were not well handled. In addition, the actions of the FBI and particularly of J. Edgar Hoover con only be considered as being treasonous.